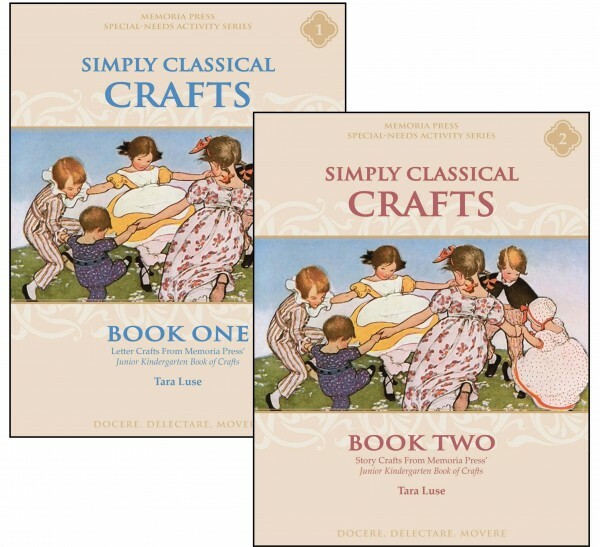 Do you need some ideas for organizing your Memoria Press classical homeschool curriculum? 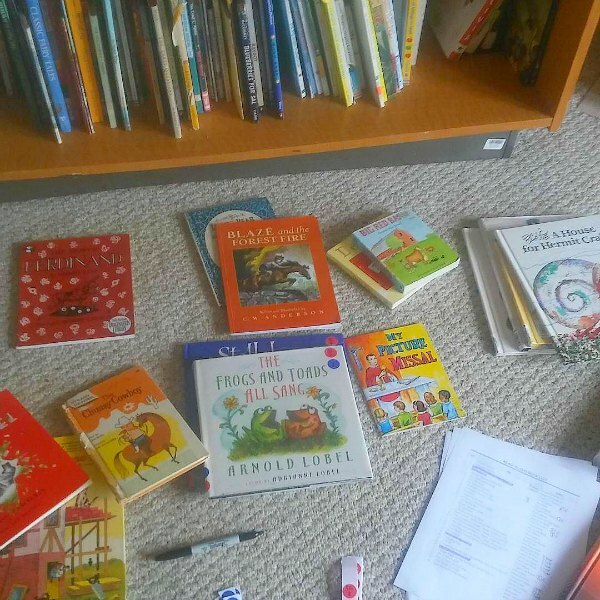 If you’ve got children in multiple cores, there’s a LOT of material to organize. These are some of the best tips and tricks that have worked in our family. This year, we have students in fifth grade, second grade/Simply Classical, and in preschool/junior Kindergarten. 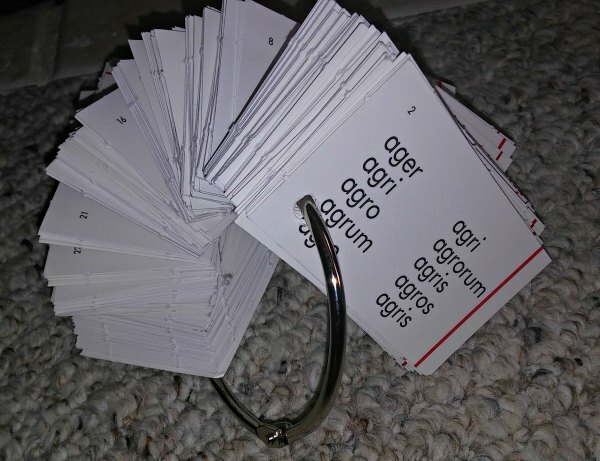 I’ve seen plenty of ideas for organizing the flash cards from Memoria Press — but still a lot of questions. “How do you separate them into ‘things we know’ and ‘things we need to review’? I buy binder rings in various sizes. Depending on how you sort the cards, some may fit on a 1 inch ring, while others will need the Mac Daddy 3 inch rings. Punch a hole in the upper left hand corner and set aside. I give my boys some hole reinforcement stickers and have them cover the holes for me on the front and back (delegating my work, plus fine motor skill practice for them). If you have multiple subjects for which you have flash cards, you can get the colored reinforcement stickers, or even color them yourself. Another idea? Before you perforate your index cards, take a Sharpie and draw a line along the side of the card. (not obscuring any information) This way, a quick glance can tell you what subject the cards cover. (Pick Blue for First Form, red for Second Form, etc.) Many thanks to my pal Jessica for this trick. Mom Tip: When punching a hole in the cards, be wary of the lesson number. I’ve been known to punch the hole right through the lesson number, then try to quiz Rachel on information she hasn’t even covered. When we’re not using our flash cards, we keep them on a command hook or on my teacher box. With children in multiple cores, this can be a huge challenge. Right now, we’re reading through some of the preschool and junior kindergarten selections for Daniel and Maeve. The boys are using the Simply Classical Level 2 for Writing, and the Kindergarten read alouds for enrichment. With a bazillion books on our shelves, it becomes confusing to remember which book goes with which level. Then, I put a colored sticker on the cover of the book, as well as on the spine. You’ll notice that some books have more than one sticker. Between the primary and Simply Classical cores, there are some selections that overlap. This way, it’s easy for me to know which ones we’ll be using in different spots. To prevent a tiny toddler from pulling off all of my carefully arranged stickers, I put a small bit of invisible tape over them. Keeps them safe from the toddler (I hope), yet still visible for my organization. Now, I still have to convince my husband to put the books back in the general MP area of our bookshelves, but that’s a work in progress. Even though your children won’t be in a traditional classroom, it doesn’t mean you won’t need supplies. I’ve always LOVED school supplies.It’s no different being a homeschooling mom. I have to rein myself in, so that I don’t buy 75 boxes of crayons. This year, after organizing my supply stash, I have a clear picture of what I need. Without a dedicated homeschool room, figuring out a place for everything can be a challenge. We do our school mostly in the living room and kitchen, so I needed something that was fairly portable. Take a look at my teacher box. In here, I keep all my teacher manuals for the year — Rod and Staff Math, the curriculum guides for the cores, and any individual teacher manuals I need for particular subjects. It’s collapsible, so at the (potential) end of school year, I could fold it up and put it away. It has wheels, so I can take it to the kitchen, or stick it in my closet for the weekend. One of my favorite pieces of the Memoria Press cores are the curriculum guides. Inside, you’ll find tips for teaching each subject, as well as templates for review cards, quizzes, and weekly lesson plans. This system works beautifully when you’re working from one grade level or core. When you have children who are more asynchronous, it becomes a little trickier. It takes a little time to get it set up, but I prefer it MUCH better than juggling 6 different curriculum guides each day. If you’ve bought a teacher’s manual for a Memoria Press course, you’ll find an added bonus in your account. You’ll find a handy PDF file of all quizzes and tests, for quick and easy printing. Wise Memoria Press moms have suggested that you take a few hours and do some preparation. 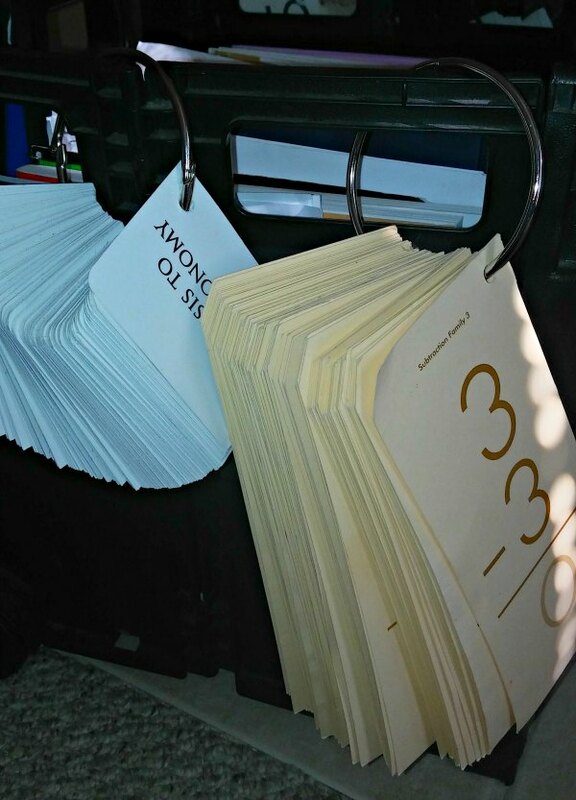 Check your printer paper and ink status, then print out all the tests and quizzes you’ll need for the year. 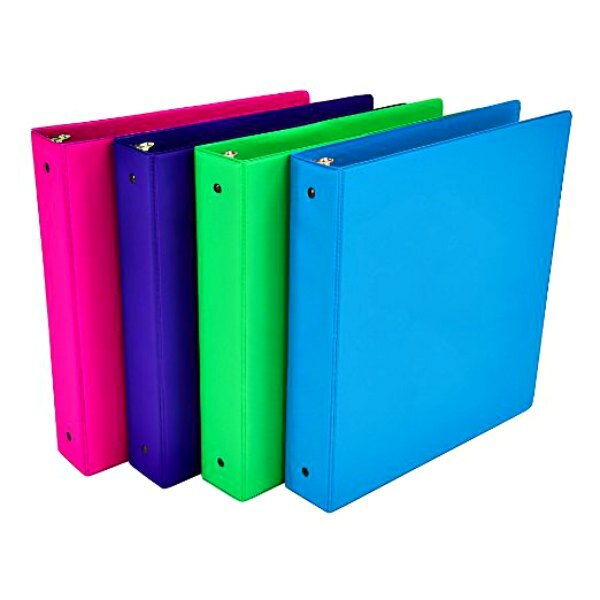 Organize them in a binder, and you’ll be able to quickly pull them out when you’re ready. Maybe you’re blessed with a charisma for crafts. It missed me by a mile. My children love crafts, but the prep and clean up make me mean. One of the lovely mommas over at the MP forums suggested taking some time to sit down, pull all the crafts together for the year, and get the supplies and templates together. When it’s time to do crafts, it’s stress free for you. Seriously, having to fix 15 meals a week is enough to make me want to sit down and cry. I want my children to have nutritious meals, but it’s HARD juggling meals, cleaning and teaching. I’m going to put off my school start date and plan two weeks worth of simple meals. I want everything the in the freezer or pantry so that I can pull it out quickly and get it started. Since I won’t be paralyzed by decision fatigue, I can devote that brain power to my homeschool day and rest a little easier. I’d LOVE to hear from you — have you tried any of these ideas already? 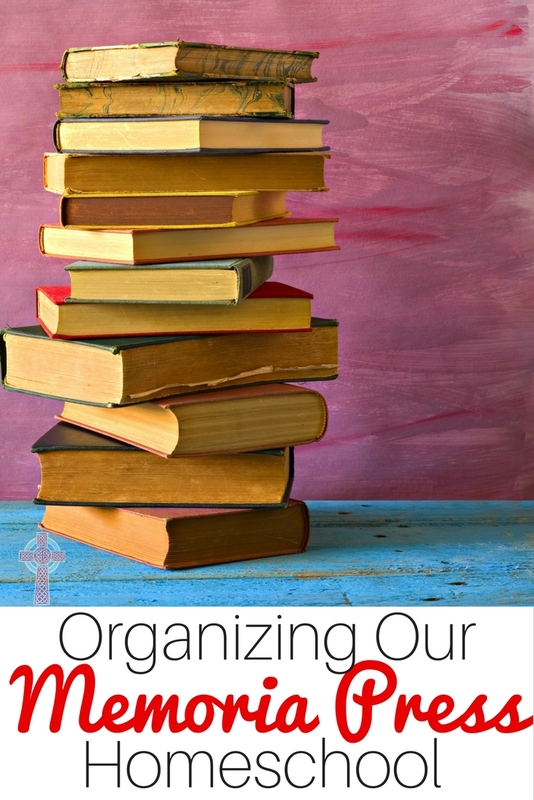 Have a sure fire solution to homeschool organization issues? Drop a note in the comments! “The (potential) end of the school year” – ha ha ha!! 🙂 It may end, it may not…some days feel that way, don’t they? I like your teacher box. I keep my teacher stuff in a small bookcase behind a kitchen door. But I do have to go back and forth frequently to grab a book I forgot, or to trade out stacks when I switch kids. 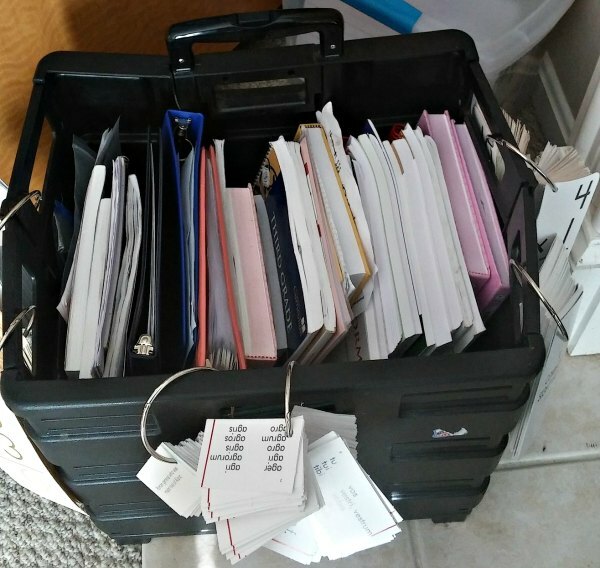 I’d need a bigger box, though…or a box for each grade I’m teaching? Have to think about that. Thanks for the tips. There aren’t many MP-specific bloggers out there, so it’s nice to see a post about MP stuff. The teacher box was something I grabbed after seeing them en masse at a homeschooling convention. As my students have grown, I think your idea of a box per grade is pretty golden. Those darn Rod and Staff math TMs are heavy. You are so welcome. It’s funny that this MP foray began as an experiment. We’re now heading into our 6th year. In ways, I can’t believe it. I’m very thankful that this is where we started, and I didn’t stray too much off the path. If you think of things you’d like to see covered, let me know. If it’s grades 5 and under, we’ve tackled it, in our own way. I have a teacher bag that’s very similar to your box! Though I do like that yours rolls…genius! 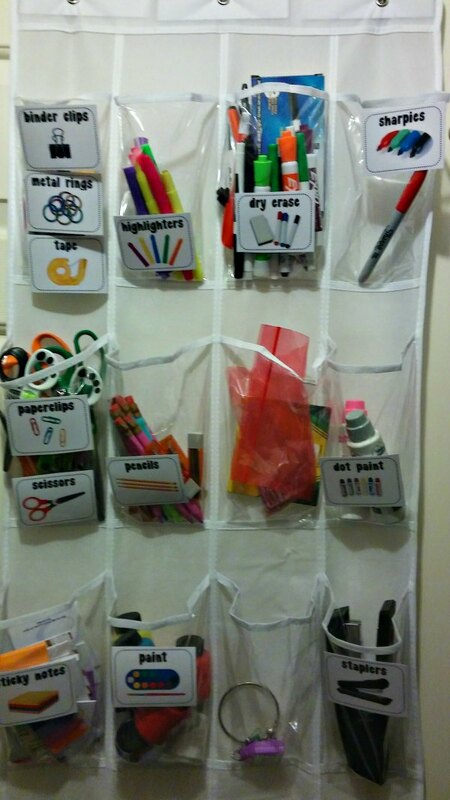 I love these organization tips! We’re gradually incorporating more Memoria Press each year and the quantity of different moving parts is a bit intimidating. I also find myself re-writing or re-typing lesson plans into a simple weekly format based on what each child is actually doing. 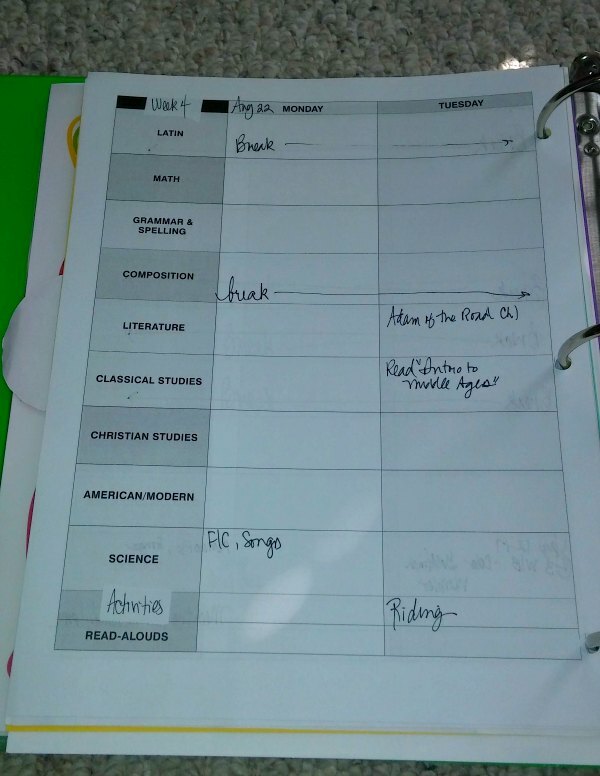 Plus I find it helps me keep tabs on what we’re doing each week and those 10 minutes copying things down for each week (I sometimes do this all at the beginning of the year) really gives me a firm idea of what we’re doing that week. We also use the digital plans from Memoria — I print the pages out at the beginning of the year and just fill them in as we go. You are incredibly organized. I’m a second generation home schooler and a first time Memoria Press. I’m about to have two kids in the program and these tips are quite helpful. Thank you! 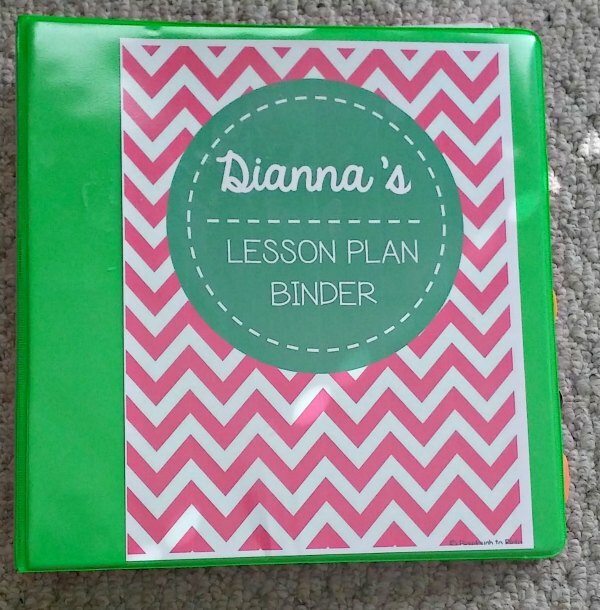 The Customizable Lesson Plan is a brilliant strategy that I didn’t realize was even available. Great tips here! Hello, I’m new to MP this year and purchased the new users for 4th grade. Curious why some print out all the tests and quizzes? Are they not included in the workbooks? Thanks.